World number one Mark Selby won the Arcaden Paul Hunter Classic for the second consecutive year by beating Joe Swail 4-1 in the final in Germany. The Betfair European Tour event, part of the Players Tour Championship series, drew huge crowds to its host city of Furth to see Leicester’s 29-year-old Selby win his first title in 11 months. It was nearly a fairytale finish for veteran Swail, who reached the semi-finals of the World Championship back in 2000 and 2001 but dropped off the main tour at the end of last season after 22 years as a professional. Competing as an amateur, the Ulsterman beat the likes of Shaun Murphy and Barry Hawkins to reach the final, before being denied the trophy by Selby. 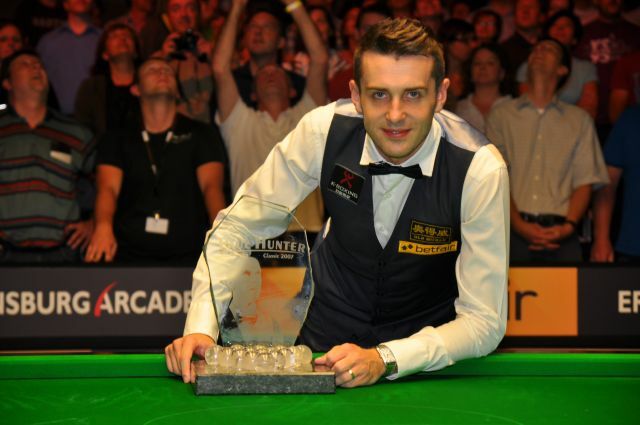 Two-time Masters champion Selby went 3-0 up with top breaks of 56, 64 and 43. Swail, age 42, pulled one back with an 83 before Selby closed out victory in frame five with an 85 to win the 12,000 Euro top prize. Earlier in the semi-finals, Selby ended the impressive run of India’s Pankaj Advani by a 4-2 scoreline, while Swail edged out Barry Hawkins 4-3 with a double on the final black to resolve a dramatic deciding frame. The Players Tour Championship is a series of ten events, four in the UK and six on the Betfair European Tour, with the top 25 on the final Order of Merit going through to the Grand Finals in March. They will be joined by seven players from the Asian PTC Order of Merit. The next event is UKPTC3 from September 5-9 in Gloucester.